Prayers and Meditations. Published from his Manuscripts by George STRAHAN. Observations on the Diseases of Seamen. The second edition, with corrections and additions. Second edition, with additional material, of one of the most important works in naval medicine. See G&M 2158 and 3715, the first edition of 1785. Blane was physician to Admiral Rodney, and later to the British fleet. He was held in great esteem by the Navy, and was instrumental in effecting improvements in living conditions among seamen. Through Blane?s influence the issue of lemon juice in the British Navy was ordered in 1795, after which scurvy soon disappeared. With Lind he stands predominant in the history of naval medicine.This copy has both the 4-page errata and the 15-page dedication (dated May 1, 1785) and preface; most copies have either one or the other.8vo, pp. viii, 4, xv, (i) blank, (17)-560, xv (index), and 3 folding tables. Contemporary half calf (spine and upper joint cracked, slight wear to foot of spine), brown morocco label on spine. Tear (or paper flaw) in O5 without loss, a very clean and fresh copy. Early signature (cropped) in upper corner of title, small personal stamp on verso. Blick in den Landschaftsgarten mit einem der zahlreichen Kanäle, im Mittelgrund ein \"Point de Vue\" mit einer antikisierenden Vase. Über den Kanal führt eine Brücke auf der eine Dame mit Kind steht. 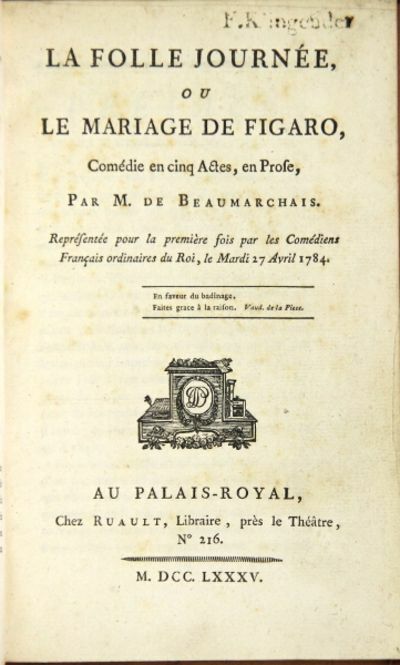 "Beaumarchais, Pierre Augustin Caron De"
"La folle journee ou le marriage de Figaro, comedie en cinq actes, en prose." [Paris]: "au Palais Royal, chez Ruault". 1785. "First edition, 8vo, pp. , lvi, 237; later full speckled calf, red morocco label on gilt decorated spine; slight wear at the top of the spine, else generally a fine copy. Contemporary ownership inscription of Alfred Vaux. Beaumarchais (1732-1799) aided the American cause by purchasing supplies for the American army in the Revolution. This play is his famous sequel to his earlier Le Barbier de Seville. It was first performed in 1784 and because of its immediate success there are many editions printed in 1785, this being the first. It was the later inspiration for the operas of Rossini and Mozart. Tchemerzine, II, p. 14- 15: ""The first edition was published without illustrations. Very soon after 5 illustrations by St Quentin were added.""" Watercolour over pencil, on early card mount. Inscribed on verso of mount. A fascinating view of St.John, New Brunswick, showing Fort Howe, with two voyageurs in the foreground. The city of St. John, situated at the mouth of the St. John River on the Bay of Fundy, is the largest city in New Brunswick and the oldest incorporated city in Canada. Following the French and Indian war, the region north of the Bay of Fundy formerly part of the French colony of Acadia, was merged into Nova Scotia and a permanent fortification on high ground was built at the mouth of the river. The city was officially formed by royal charter in 1785. 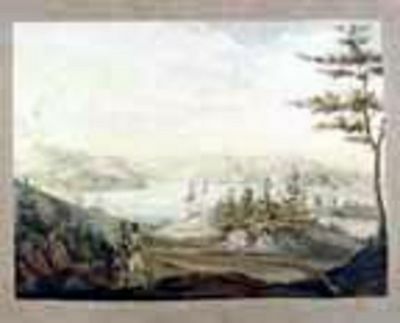 This lovely early 19th century view by an unknown but talented amateur artist shows two voyageurs looking eastward across the harbour with the growing city in the distance. Clearly visible, and the tallest structure in the small city, is Trinity Anglican Church, constructed in 1791. Historia Ecclesiastica Veteris Novique Testamentis, ab orbe condito ad Annum post Christum natum millesimum sexcentesimum: et in loca ejusdem insignia dissertationes historicae, chronologicae, criticae, dogmaticae (20 Bände KOMPLETT) - Tomus I - XVIII + Supplementum I/ II. Reise durch Polen, Rußland, Schweden und Dänemark. Mit historischen Nachrichten, und politischen Bemerkungen begleitet. Aus dem Englischen, von J[ohann] PEZZL. 3 Bde. London: G. Kearsley, 1785. VERY RARE First Edition of William Cooke's very early biography of Dr. Johnson. 8vo, original unbound printer's sheets and with the printer's original blue paper front wrapper, now laid portfolio style into a clamshell box of green cloth with gilt lettering on the spine. iv, 144 pp., with the front blank. 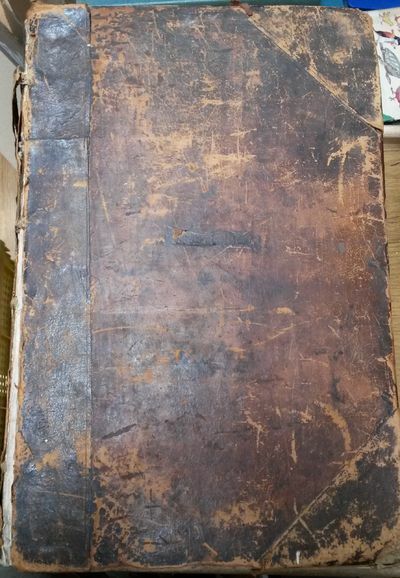 Unbound printer's sheets, very scarce thus and a remarkable survival in this rarest of states. The paper still fresh and unpressed with only a little wear along the untrimmed edges, the last two leaves (the catalogue leaves), with marginal loss at the lower outside corner. The lack of the portrait in this copy likely because it would have been sent separately from the engraver's shop to be installed by the binder, who never laid hands upon this copy. 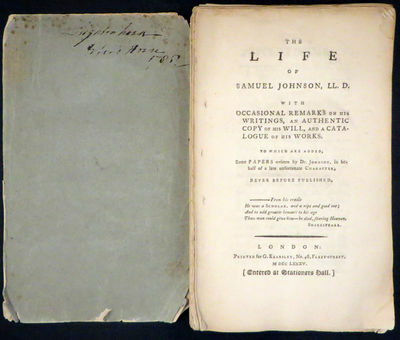 VERY RARE FIRST EDITION OF THIS EARLY BIOGRAPHY OF JOHNSON, known to be used by James Boswell when writing his own great biography. Copies turn up very rarely and this copy in printer's original condition is most likely unique. for W. Colles, R. Moncieffe, G. Burnet, 1785 Dublin: for W. Colles, R. Moncieffe, G. Burnet [&7 others in Dublin], 1785. 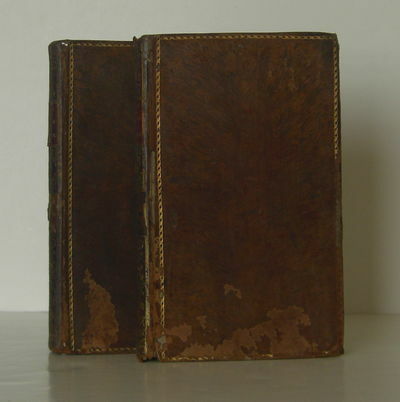 2 volumes, octavo (207x123mm). Contemporary calf, covers and spine ornately decorated in gilt, label missing from volume 2. An excellent set, internally clean and fresh. Second Dublin edition, reprinting the text of the third London edition of 1784, the last edition to which Smith made any significant revisions, with longer treatment of the deficiencies of the chartered companies and an extra summary chapter. Smith is often cited as the "father of modern economics" and is still among the most influential thinkers in the field of economics today. One of the most important works in the history of economics. "The Wealth of Nations" is considered Smith's magnum opus and the first modern work of economics. Housed in a custom-made collector's slipcase.. 3rd Edition. Hardcover. Very Good. Argens, Jean Baptiste de Boyer Marquis d&#146;. Des Herrn Marquis d&#146;Argens [.] Jüdische Briefe, oder philosophischer, historischer und kritischer Briefwechsel, zwischen einem Juden, der durch verschiedne Länder von Europa reiset, und seinen Correspondenten an andern Orten. Aus dem Französischen, mit des Herrn Verfassers [.] Vermehrungen und Verbesserungen übersetzt. 6 in 3 Bänden. Memoirs of Baron de Tott. : Containing the state of the Turkish Empire and the Crimea, during the late war with Russia. With numerous anecdotes, facts, and observations, on the manners and customs of the Turks and Tartars. Translated from the French. London G.G.J. and J. Robinson 1785 - A very good set bound in contemporary speckled calf, neatly re-backed. Corners bumped. First English edition, Two volumes, pp.xxxv, , 238, , 236; , 204, 160, [18, index]. Paris : Chez Buisson, 1785-01-01. Hardcover. Good. Important book on Kentucky. 1st French ed. (Printed a year after the 1784 Delaware ed. with additions). xvi, 234 pages, with the engraved folding map "Carte de Kentucke, d'apres les Observations actuelles; dediee a ... Son Excellence George Washington." Contains the first map of Kentucky. Internally, generally clean and crisp. Contemporary 1/4 calf over red boards with minor restoration work. <br> Deals heavily with the Shawnee tribe. Also includes a chapter on Daniel Boone's captivity, "Aventures du Colonel Daniel Boon, contenant la Relation des Guerres de Kentucke." <br> "The most famous and important frontier book of the period, by a frontiersman who was later killed by Indians. Particularly important for its first map of Kentucky and its first published life of Daniel Boone." Vail, Voice of the Old Frontier, 694. "The first history of Kentucky. It contains the first map of Kentucky and probably the first account of Daniel Boone" - Clark II:27. Church 1212; Field 537; Howes F129; Sabin 24338; Jones 590; Littell 351; Coleman 3239. Full title: Histoire de Kentucke, nouvelle colonie a l'ouest de la Virginie : contenant, 1. La decouverte, l'acquisition, l'etablissement, la description topographique, l'histoire naturelle, &c. du territoire : 2. La relation historique du Colonel Boon, un des premiers colons, sur les guerres contre les naturels : 3. l'Assemblee des Piankashaws au Poste Saint Vincent : 4. un expose succinct des nations Indiennes qui habitent dans les limites des treize Etats-Unis, de leurs moeurs & coutumes, & des reflexions sur leur origine ; & autres pieces : avec une carte. : Ouvrage pour servir de suite aux Lettres d'un cultivateur americain. A Maestricht... M.DCC.LXXXV . 12mo; two volumes: xxiv, 458, 432 p. Addressed to William Seton. Pages 94-211 in vol. 2 relate to Nantucket and Martha's Vineyard. A free translation by the author, with large additions, of "Letters from an American Farmer". ?This volume was more widely read in England and Europe and had a greater influence in attracting its readers to America than any other book of the period?-- Vail 674, describing the English first edition of 1782. This is one of the rarer editions. References: Sabin 17494; Vail 724; Echeverria 785/18; Clark I: 218 (8). NUC 127: 203 (NC 0788743) DLC, LU, IEN, CtY. Bound in full blue leather, gilt, by Jim DiMarcantonio, Hope Bindery & Box Co. stock#NS0275. Leges civiles juxta naturalem earum ordinem jus publicum et legum delectus auctore celebri Domat Regio advocato in praesidiali curia claromonti in averniis. Editio prima latina. In qua nil desideratur ex iis omnibus, quae postrema editione gallica Parisiis facta occurrunt. Tomus I ( - IV). Orlando innamorato di Matteo Ma. Bojardo, rifatto da Francesco Berni. 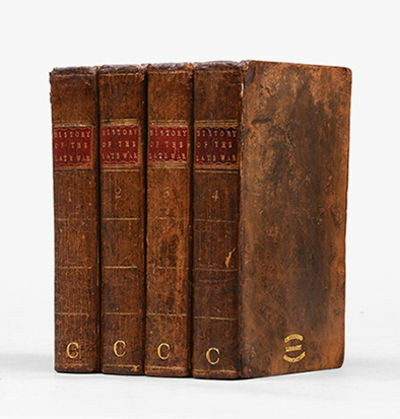 En 5 volumes. Venezia, Antonio Zatta, 1785, - sm. in-8vo, illustrated with alltogether 5 identical title portraits (Francesco Berni) and 69 cute vignettes (engraved by Daniotto and C. Dall'Aqua), very beautiful marbled calf bindings, red and green labels on spine, rich goldtooling on spine, small imperfection or stain on 2 covers, light rubbing to a few corners, sprinkled edges. The «Orlando innamorato» completely rewritten by Berni, being by far better appreciated than the original version by Bojardo. Illustrated with cute engraved vignettes heading each one of the 69 chapters.Originally written for the amusement of the author's patron, Duke Hercules D'Este, this is the inventive and humorous story of Orlando's love-striken pursuit of Angelica through a fairyland that combines the military valours of Charlemagne's crusaders with the enchantments of King Arthur's court. ?Le poème le plus célèbre de Bojardo, quoique le moins lu, est son «Roland amoureux». . L'Arioste . en le continuant, et le Berni, en le refaisant, l'ont tué. .? (Hoefer).Please notify before visiting to see a book. Prices are excl. VAT/TVA (only Switzerland) & postage. Hoefer NBG III/622-623 and IV/483-484; Diz. Lett. Bompiani (1948) V/312-316. Recueil d'observations et de faits relatifs au magnétisme animal présenté à l'auteur de cette découverte et publié par la Société de Guienne. Paris, chez les marchands de nouveautés, & à Bordeaux, chez Paul Pallandre le jeune, 1785, in 8°, de 2ff. 168pp., demi-percal. bleue début XIXe, bel exemplaire avec un ex-dono du Comte Maxime de Puységur "à mon fils Anatole, à Bordeaux, ce quinze mars 1841" Edition originale rare de ce recueil d'expériences de la Société de l'Harmonie de Guienne, avec une lettre à Mesmer, et des relations de cures opérées à Bordeaux et à Bayonne. A la fin se trouve la liste des membres de la Société de l'Harmonie de Guienne: Président le Cte Maxime de Puységur (auteur de l'ex-dono), le Dr Archbold auteur du présent recueil, les Dr. Pradelle et Fitzgibbon, M. Duval d'Espremesnil conseiller au Parlement, l'abbé Pouzoulat fondé de pouvoir de M. Mesmer, le Vicomte Duhamel etc... ¶ Crabtree n°120 (erreur sur le nom Archbold, n'a visiblement pas vu d'exemplaire) - Caillet n°371 "Intéressant rapport de l'une des sociétés fondées en province, à l'instar de la Société de l'Harmonie de Paris". - Pas dans Dorbon - Barbier IV.54. Almanach, Op 't Jaar ons Heeren Jesu Christi, 1785. Voorsien met de Jaar-, Paarde-, Beeste- en Leermarkten, En de Maans op- en ondergang. WITH: Reys-Wyzer, Wanneer de Veerschepen en Trekschuyten moeten afvaren. Ook het luyden der Poortklokken van Amsterdam, Haarlem, Enkhuysen, Gouda en Leyden. WITH: De opregte Italiaanse Waarzegger. WITH: Korte Kronyk, beginnende van den Jare 1711. Amsterdam, the Heirs of Widow Cornelis Stichter 1785. 4 works in 1 binding, 30, 11, 5, 16 p. Contemporary Leather with gilt-edged text block, silver catches and a silver linking pin, 16° H. 8,5 x L. 5,5 x W. 1,5 cm. (Waterstain on the first pages, one page of the Reys-Wyzer lacks a small piece of one of the corners. The 4 silver catches are decorated with the coat of arms of the city Leeuwarden. 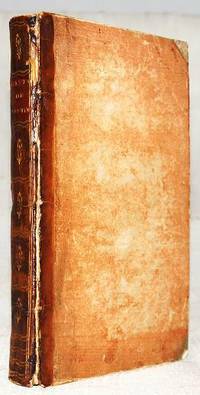 Rare edition of the Almanac for the year 1785 by Meyndert van Dam, ca. 1730-1812. This miniature sized almanac describes in the first work the forthcoming events for the year 1785, illustrated with a woodcut title vignette and a calendar printed in red and black with multiple small woodcuts of the moon phases. The second work is a time-table for the departures of ships, illustrated with a woodcut title illustration. The third work contains astrological predictions and the final work lists important events which occured from the year 1711 until 1784, illustrated with a woodcut title illustration.) Salman, J. (2011). Populair drukwerk in de Gouden Eeuw. De almanak als lectuur en handelswaar. Neueste Reisebeschreibungen und Entdeckungen des fünfthen Welttheils welche sowohl in Gesellschaft der Herren Esq. J. Bancks und Dr. Solander als nachher unternommen worden. Zweyter Band. / Reise eines französischen Offiziers durch die barbarischen Staaten Marokko, Algier, Tunis und Tripolis. Der Wasserfall mit dem Obeliske in dem K. K. Garten von Schönbrunn - La Cascade avec l'Obelisque dans le Jardin Imp. et Roy. de Schoenbrunn". Aus: Ansichten der Residenzstadt Wien. SPALLANZANI (Abbé Lazzaro) - SENEBIER (Jean). Expériences sur la Digestion de l'Homme et de différentes espèces d'animaux ; par l'Abbé Spallanzani, avec des considérations sur sa méthode de faire des expériences, & les conséquences pratiques qu'on peut tirer en Médecine de ses découvertes ; par Jean Sénebier. Suivi de : Observations importantes sur l'usage du Suc Gastrique dans la Chirurgie ; rassemblées par Jean Sénebier, avec quelques additions de M. l'Abbé Spallanzani à ses expériences sur la digestion. SIGAUD DE LA FOND M.
- A Paris, rue hôtel Serpente, 1785. In-8 demi-basane tabac à la bradel, dos lisse orné de filets dorés formant faux nerfs, pièce de titre orange, (1f+XVI+2ff+624pp+2ff+pl.+1f). Reliure du XIX°, modeste mais correcte, sans manque; quelques traces et frottements sans gravité, coins cassés, rousseurs éparses mais modérées n'affectant pas réellement l'ouvrage, bonne typographie. 10 planches dépliantes in fine. "Sigaud de La Fond est né à Bourges en 1730. Inscrit à la faculté de médecine de Bourges, il est reçu docteur, et monte se perfectionner à Paris. Attiré par les sciences expérimentales il devient un des auditeurs les plus assidus de l'abbé Nollet, professeur royal de physique au collège de Navarre. Parallèlement il est nommé répétiteur de philosophie et de mathématiques au collège des jésuites Louis-le-Grand. Rapidement il est en état de perfectionner des procédés usités avant lui : ainsi il substitue aux isoloirs connus sous le nom de gâteaux électriques (composés d&#146;un mélange de résines) l&#146;isoloir de verre plus performant. En 1756, toujours dans le domaine électrique, il conçoit le plateau circulaire de verre, premier modèle de la machine électrique perfectionnée ensuite par l&#146;anglais Ramsden. En 1759 les Jésuites lui confèrent le titre de démonstrateur de physique expérimentale au collège Louis-le-Grand, puis parallèlement en 1760, il assume la succession au collège de Navarre de l&#146;abbé Nollet, figure emblématique du siècle des Lumières dans le domaine des sciences expérimentales." L'Impero del Giapon diviso in sette principali parti. Venezia, 1785 - Incisione in rame, coloritura originale d'epoca, mm. 324x418. Da "Atlante Novissimo" di Zatta, editore e cartografo pubblicò atlanti, libri. Splendido esemplare. America Settentrionale divisa ne&#146; suoi principali Stati Venezia - Presso Antonio Zatta, e Fili. Antonio Zatta., Venice 1785 - Copper engraving, in contemporary original color in outline. Published in Zatta&#146;s "Atlante Novissimo". In excellent condition. The History of the Revolution of South-Carolina, from a British province to an independent state. 1785. Engraving. Proof before dedication, with artist names and title but before dedication and publication line added and title space darkened. Two collectors marks on verso of sheet. In excellent condition with the exception of some limited foxing. Crease on right edge of sheet. Image size: 13 13/16 x 9 3/4 inches. 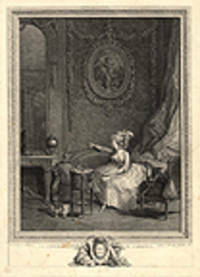 A rare proof impression of this stunning boudoir scene after a miniature by Nicolas Lavreince. Genre painting came to France when the Academy admitted Watteau's "The Pilgrimage to Cythera" in 1717. From that point on a fashion for decorative genre subjects swept the country, influencing an entire generation of French artists. This craze did not subside until after the onset of the Revolution when the frivolous tastes of the aristocratic elite were dispelled and a more sober era descended upon French art. This extremely well executed print by Nicolas de Launay is after a painting by the celebrated Swedish miniaturist Nicolas Lavreince, who built his reputation with paintings of intimate boudoir scenes. In this scene, an elegantly dressed woman seated on a settee in a lavish boudoir gazes longingly at a miniature of her lover, and holds a love letter in the other hand. On the wall above, in an oval portrait, Cupid aims his arrow, though she is already clearly his victim. A little toy dog plays in the foreground, unaware of the sighs and sorrow. From the collection of Frederic R. Halsey, a famous New York print collector, who was active during the latter part of the 19th century. (Lugt 1308). Also from the collection of Cortland Field Bishop (1870-1935) a New York collector, who had a renowned collection of French eighteenth-century prints. (Lugt 2770 b) Nevill, French Prints of the Eighteenth Century p. 169; Lugt, Les Marques de Collections 1308; Lugt, Les Marques de Collections, (Supplement) 2770 b.
London: J.F. Rivington, et al. Good. 1785. Seventh. Hardback. Please note that this is an extremely heavy item and will require extra postage. ; Dk brown leather half-binding; very worn. Front board + front endpaper detached, but present (repairs previously made to this joint). Backstrip worn - stitched binding exposed in places; raised bands on spine. Text block + rear board themselves intact - ie no pp loose. pp remain very supple. Bookplate on front pastedown. This is a scarce early one volume edition, complete. ; 4to (11 1/2" x 17"); Unpaginated pages . Glasgow: "printed by Andrew Foulis, printer to the University". 1785. 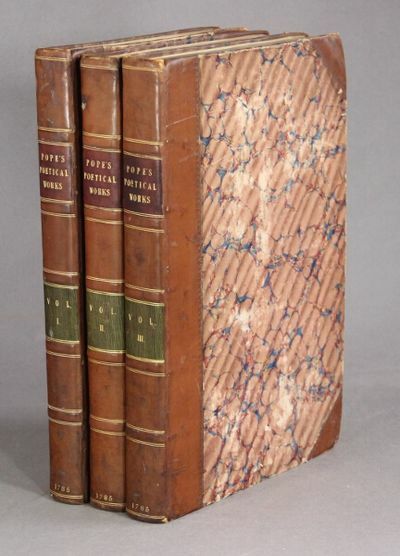 "Folio, 3 volumes, pp. xxxii, xxxviii, -315; [vi], 365, ; [iv], 402,  subscriber list; contemporary half polished tan calf, red and green morocco labels on gilt-paneled spines; very good and sound. Gaskell 678." [England, 1785. Printed on cotton in brown ink. Contemporary cloth border, stitched. Lightly soiled. Very good. Portion of a larger printed textile entitled "The Apotheosis of Franklin," this piece shows Franklin standing next to Lady Liberty, each of them holding one end of a banner which reads "Where Liberty is, there dwells my country." 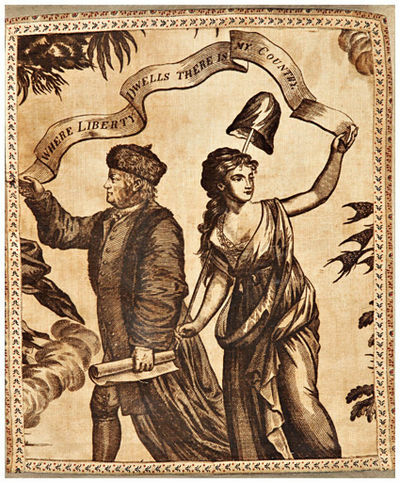 In his other hand, Franklin holds a scroll; Liberty holds a pole with a liberty cap perched atop it. The further images on the textile (not present here) show Washington driving a chariot drawn by leopards, with an allegorical figure of America seated beside him holding a plaque which reads "American Independance [sic] 1776." Ahead of Washington's chariot, two Indians bear trumpets draped with flags of the Revolution. The Liberty Tree and two putti holding a map of America are also featured. A full panel of the cloth measures thirty-six inches wide and could be purchased by the yard, in a repeating fashion. This textile probably came from the collection of celebrated Americanist R.H.T. Halsey, one of the founders of the American Wing of the Metropolitan Museum of Art. THREADS OF HISTORY 8. Caps Well Fit: or, Select Epigrams. Serious and Comic. By Titus, in Sandgate, and Titus, Everywhere. Ansicht v. Ruine und Kloster Ehrenstein, "Vue du chateau et Convent d' Ehrenstein". - Kst. 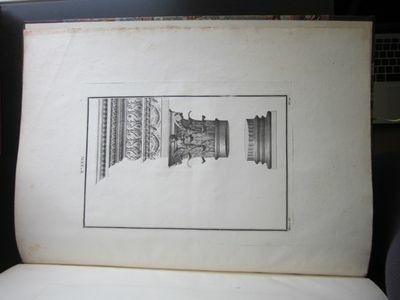 v. Volkart v. Volkart n. C. Dupuis, 1785, 18,5 x 28,5 Siehe auch bei Merlo: Kölner Künstler, S. 206. - Sehr seltenes Blatt. Blick über den Mehrbach zum Kloster, links die Ruine Ehrenstein. Große Erdbeschreibung. Bde. 4-6 (in 1).